Lol if your Gonna get a LOT. Managed hour and half on Monday, very lucky with weather. Mild and sunny again. Trying to take Hogan round less familiar routes, which he used to get a bit silly about, but taking more and more in his stride now. Managed to go past 6 or 7 forest ponies without breaking his stride - I let him look but not stop. Getting a lovely trot out of him now - next must try a trot in company! (Last time he threw a complete wobbler, but that was with the pony that wound him up something rotten). Halts brilliant now and happy to stop 100 yds from home gate while I chatted with neighbour. Baby steps, but I'm SO proud of him! Annoyed with the weather today - got to the yard just too late, and Hogan was drenched! Didn't stay dry enough long enough to get him dry. May have to start popping a rain sheet on the night before I intend to ride. That sounds like a good plan! How vexing getting rained off. Though sometimes I have just taken a pile of towels and soaked up the excess off Zi, then tacked up. I have a woollen saddle pad - maybe that helps? I did the towel thing on Monday - he wasn't quite dry when we went out, but near enough. Just so frustrating when it stops raining 10 minutes AFTER he's got soaked! Managed hour's hack today, but VERY windy. Both Hogan and his very calm bestie fitted in a good spook each - Hogan at the ripples the wind made in a puddle. . Kept it to walk today, and although they were both on their toes, it was relatively uneventful. Had put a rain sheet on last night, and glad I did, as it rained off and on until about 2 hours before we set off. A frustrating weekend for me. Saturday was very windy - too windy for me to take the mad grey thing out hacking. Instead I borrowed YO's veteran and had a hack around with her (and even he had a couple of spooks. By 3:30 the wind had dropped a bit so I took Harvey in the school. He was a bit mad and kept spooking and running (I think the grass coming through is having an effect too). We ended up cantering round, and round, and round, and round until I was getting dizzy and still he didn't want to stop. I tried to do some jumping which will normally get him focussed but he was just running at the fences so I gave up. 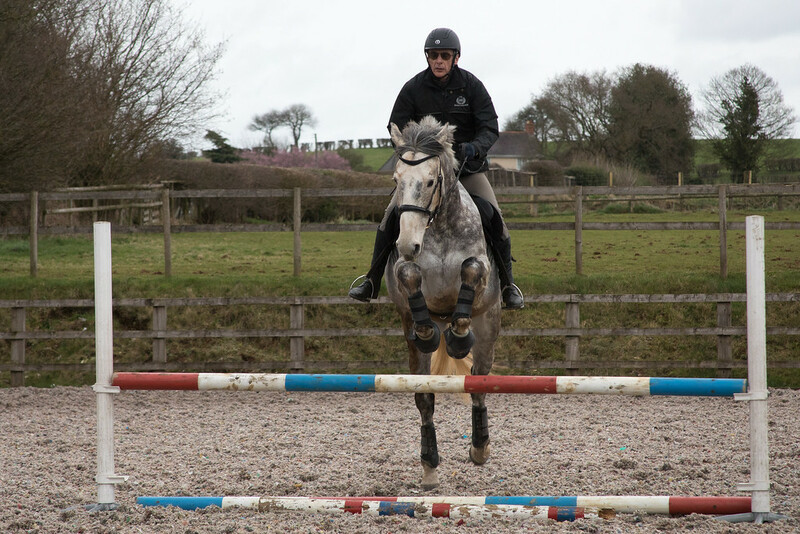 On Sunday it was my third attempt to get to my first SJ clinic at 90cm. I knew the lorry battery was a bit flat so I had it on charge the previous day, but it was completely dead. I tried to jump start it off the car which I have done many times before but that didn't work either so another clinic cancelled The mechanic is going to come and look at it and fit a battery isolator but I haven't got a date yet so no more going out and about for me at the moment. It was too windy to hack again so I hijacked the yard veteran again to cheer myself up. 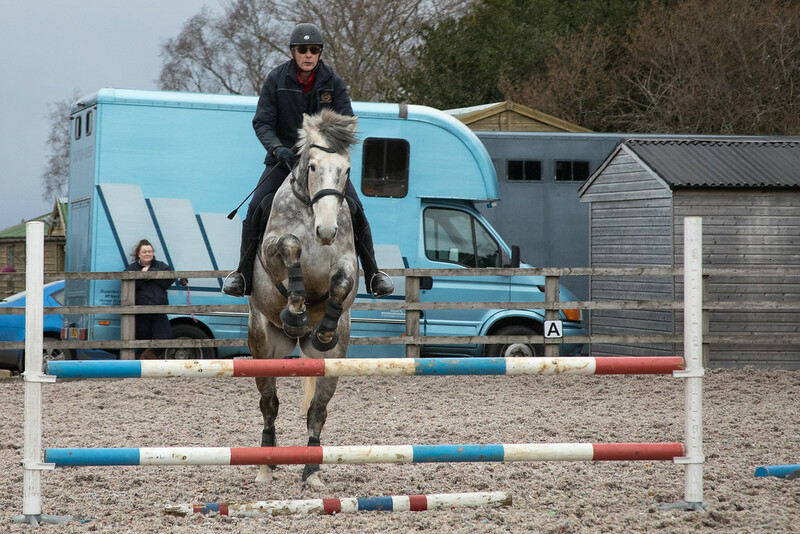 In the late afternoon I had a lesson at home and to my surprise Harvey decided to play nicely. We are still concentrating on working on my steering and rhythm. Sorry that all my piccies look the same - they are different ones honestly! It's been horrible week here with snow and record cold temps there is a bit of melting. Yesterday and today . And lots I'd sun til Thursday with rain Friday. Hopefully I can try and play soon. Always good when a frustrating weekend finishes on a good note - perseverance paid off! Yet again you trump us all on the bad weather stakes! Hope it clears up for you soon! But better weather is in the cards . WOO HOO I DID GET TO PLAY TODAY!!!! Im just happy I could get some play in at all. The wind came up very gusty but he was still really good no silly britches. I did all the early am snowblowing later my husband did more of the worse of the shoveling and made a race track for the goats. I will be VERY HAPPY to see green again. Love the goats on their roundabout race track! But they all needed it . He made one in the other goats area too. The snow was too deep for them to move about easily. It was cute to see them chasing around. I really don't fancy riding on/in snow - but I guess needs must! Not my favorite either .